If you’ve been active on social networks lately or been following the news, you’ve probably seen people getting very angry about something called Airtel Zero, and fighting for net neutrality. Wondering about what it all means and if it is one of those things that won’t really affect you directly? CoolPCTips tells you all you need to know about net neutrality, why you SHOULD be bothered, and how Airtel’s new ‘free’ platform isn’t free after all. So before we begin, you need to understand what net neutrality actually means. It’s basically the principle that the internet should be free and open to all, not discriminated by site, platform, content, user, or whatever other factor you can think of. More specifically, all data on the internet, no matter where it’s going to or coming from, should be treated equally. No websites should be blocked or rendered inaccessible. No websites should be given more or less priority based on any agreements with ISPs. No ‘zero rating’ policies, which means that no websites should be made free over the others. No internet based services should be charged for separately by ISPs. India doesn’t have any particular laws for net neutrality, so we’re actually already seeing some of these rules being violated. Twitter access specifically free for one telecom provider? Yeah, that’s against net neutrality as well. Some of these smaller violations might not affect you directly, but when it happens on a larger scale, that’s where you will face problems. What if you’re forced to use a certain e-commerce website even if you don’t prefer it, simply because it pays for higher speeds to the ISP? In the end, not only are you being forced to use a service, you’ll bear the costs through higher pricing in some way or another. After all, companies run on profits. According to Airtel, Airtel Zero is a B2B platform that lets companies pay it so that users can access their services for free. According to them, it’s similar to a toll-free telephone platform where users can access services for free or lower costs. Now, they’re also claiming same pricing for all companies that sign on, so that every company, even the smaller ones can get the sort of outreach the bigger ones have. In principle it probably sounds fair, but it’s really not. First and foremost, any portal or gateway that leads to ‘free’ services is in violation of net neutrality. Not to mention, the ‘free’ services won’t actually be free. The money that goes to the ISP will indirectly be taken from you in the form of increased data costs or higher product costs. A shopkeeper wouldn’t pay extra to a company so its products can be sold at a lower rate to consumers, right? It’s pretty much the same thing. Then of course, there’s the pricing, which hasn’t been revealed. If this platform is offered to all companies, including smaller ones at the same cost, it’s pretty apparent that the platform is not equal. Smaller companies obviously won’t be able to put in as much money as the bigger companies can, and they will end up lagging behind because they cannot afford to keep up. Airtel’s claim that the Zero platform will offer lower marketing costs becomes completely irrelevant. In fact, an official statement from Srini Gopalan, Director of Consumer Business says that “I’m not going to talk on my pricing structure a year on. This will stay non discriminatory, but how it will evolve, I can’t comment on“. So somewhere down the line, the platform could become prohibitively expensive, even if it isn’t already now. 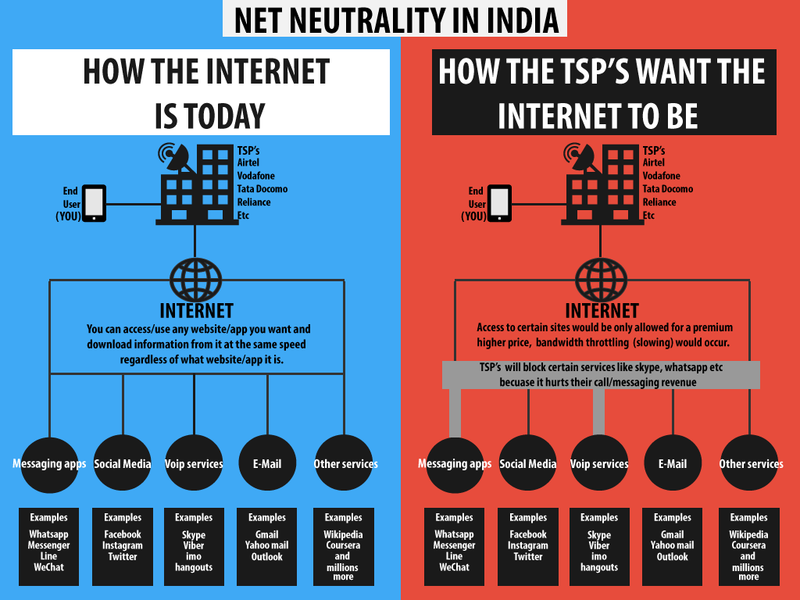 As mentioned above, India doesn’t really have any net neutrality laws. There have already been violations of the internationally accepted guidelines regarding net neutrality, and Airtel Zero is something that takes advantage of this fact. The TRAI is actually considering charging for OTT (Over The Top) services like WhatsApp, Viber, Skype and the like, because in the recent past their growth has resulted in lower traditional revenue through phone calls. There is currently a consultation paper out that might lead to allowing telecom operators to charge for these services. You can read this paper here. According to them, OTT services directly result in lower revenue, therefore should be charged separately. Now that is again completely against the principles of net neutrality. Telecom operators meanwhile seem to think that like voice and data, OTT services should also be licensed and regulated, and not considered part of regular internet data. But since it’s a consultation paper, it’s still open to debate and discussion, and even you can send in your opinions at the email ID mentioned on the paper. So theoretically, if telecom operators are allowed to go down this path, they can overcharge for internet access, prioritize access to certain companies, throttle bandwidths, block services and render it impossible for smaller companies to gain a foothold in the online arena. If that doesn’t sound like bad news, we don’t know what will. To make it simpler, here’s an infographic that depicts what it all means, courtesy of an Indian Redditor. Do visit SaveTheInternet for more, and to see what you can do!